Avocado is a kid favorite. Because kids can’t get enough of them, we love to talk about ’em. Here’s a great way to dice a ripe avocado that parents will love. Start with a ripe avocado. It should feel soft, but not too mushy. If it’s not quite ripe, put it in a paper bag, close it up, and leave it on the kitchen counter (not in the fridge) to ripen. A grown-up can help cut the avocado in half with a sharp knife. Twist the halves of the cut avocado. Pop out the pit with a spoon. Hold one avocado half, cut-side up, in the palm of your hand. Use a butter knife to cut long lines down the avocado. Next, cut lines across the avocado, as shown. Then scoop out the diced avocado pieces with a spoon. Avocado can be used as a garnish, a sandwich spread, or to make guacomole as a chip dip or to brighten up your salad. If you want the kids to get excited about avocados try our recipe for baked tortilla chips. Make it in just 15 minutes and then mix up a little guacamole for them to dip them in. You’ll find a great recipe called “Guac and Roll” in our Taco Truck Fun Kit. 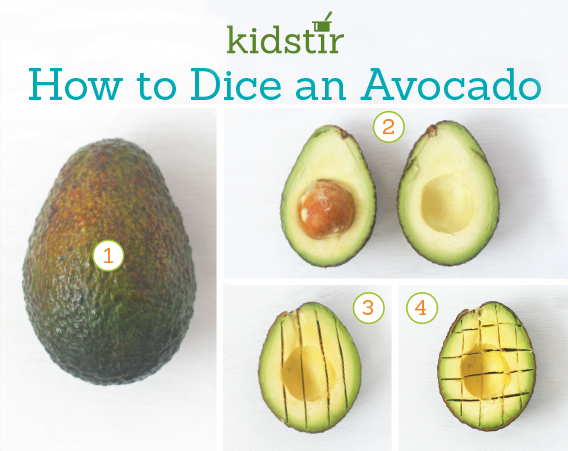 We’d love to offer Kids our “Dice a Ripe Avocado” infographic for you to share on your blog. Just select and copy the code snippet below and paste into your next blog post. 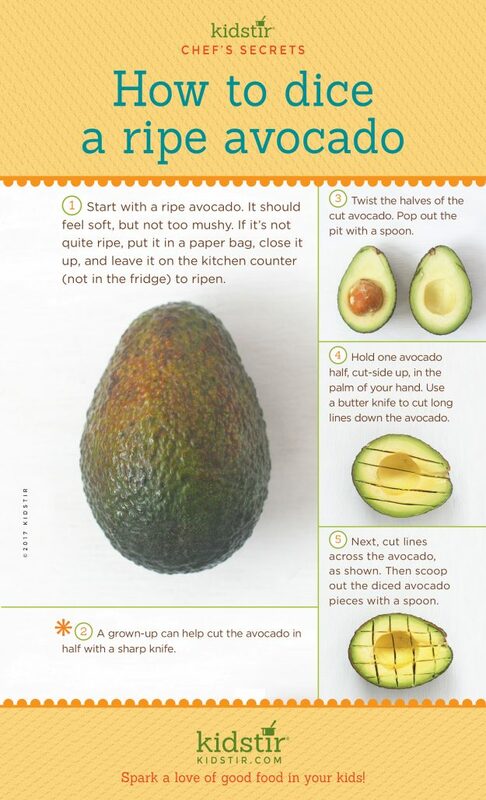 We’d love for everyone to share this page on social media or email by using the buttons below to share our How to Dice a Ripe Avocado Infographic!